We arrived at Fort Union Trading Post National Historic Site the afternoon of September 11 and met with the staff we would be working with for the next two weeks. The park has a very small staff, which is nice, and we will be able to get to know everyone. We spent the rest of the afternoon settling into our RV site, which is located next to maintenance building. The site has full hookups and is located just a few minutes away from where we’ll be working. It may not be the most scenic site, but it’s perfect for us. We are so grateful that we didn’t have to look for a hard-to-find campsite at one of the campgrounds that caters mostly to oil field workers. Tim’s contract at Fort Union Trading Post National Historic Site involves organizing, rehousing and cataloging the park’s herbarium sheets. These sheets comprise Fort Union’s collection of dried plant specimens, which are mounted and labeled for reference. The original plan was for me to help Tim with some of the organizing and photographing. I would spend the rest of my time as a volunteer. I had planned to edit the park’s web site and other printed materials. Helping Tim, however, became more of a priority, and I soon began working exclusively on sorting and alphabetizing the herbarium sheets by family, genus and species; labeling folders with genus names (thank goodness I learned how to print nicely in first grade); labeling each sheet with the catalog number; filing the sheets into the appropriate folders; photographing each sheet; labeling the divider sheets and placing the folders into the herbarium cabinet boxes. What did Tim do, you might ask? He spent his time wrestling with computer programs and entering all of the data about each sheet into the catalog database. I think I preferred my job. I thoroughly enjoyed learning something new, working with Tim and being involved in his project. We were very proud of what we accomplished. The best part, however, was working with the wonderful staff. Everyone was so welcoming and made us feel like a part of the team. Even though we worked six days a week, we also had time to learn about the fort and to visit a few of the nearby sites. 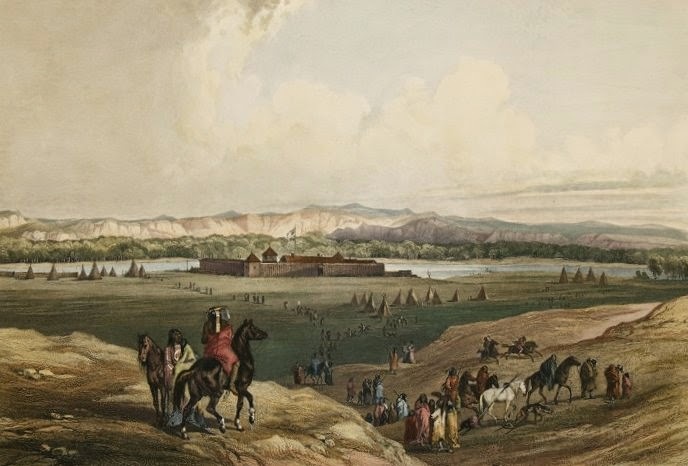 Fort Union was the most important fur trading post on the upper Missouri River and operated from 1828 to 1867. Built by John Jacob Astor’s American Fur Company, Fort Union is located at the confluence of the Missouri and Yellowstone rivers. The fort was never a military post, but instead a center of peaceful trade between the Plains Indian and white cultures. Fort Union Trading Post National Historic Site is a partial reconstruction of the original fort, based upon extensive archeological excavations and historical documentation. I was especially interested and amazed at the number of artists and other people who visited Fort Union during the nineteenth century. George Catlin, Karl Bodmer and John James Audubon were just a few of the famous guests who passed through Fort Union. The paintings, sketches and descriptions of the fort these individuals produced left an invaluable record that assisted in the reconstruction. I was able to take the time to hike the Bodmer Overlook trail, which leads to the point where Karl Bodmer made his sketches of Fort Union in 1833. This vantage point provided an expansive view of the fort and the confluence of the Missouri and Yellowstone rivers in the background. The oil boom, however, intruded into my view when a train carrying a line of oil cars passed in front of the fort. Past and present – will they be able to coexist? Tim and I also visited nearby Fort Buford State Historic Site, a military post established in 1866, and the Missouri-Yellowstone Confluence Interpretive Center, which had exhibits on the history, geography and geology of the area. With a bit of trepidation, we also ventured into Williston, the closest large town to the park, for groceries. Surprisingly, it was not as crazy as we expected, probably since we went on Sunday. We had lunch at a surprisingly good Thai restaurant, completed our errands and quickly returned to our little sanctuary. The weather was crazy the entire time we were at Fort Union. There was frost in the mornings during our first week and a heat wave with temperatures in the 90s the second week. Grasshoppers and crickets were everywhere, as well as swarms of mosquitoes, making sitting outside virtually impossible. Who would have thought there would be mosquitoes in North Dakota in September? The only real drawback to our location was the virtual lack of any internet or cell phone signal. We were really cut off from the world for two weeks. Tim was able to find four PBS stations and occasionally one or two network stations. Our evening highlight was watching Ken Burns’ documentary, “The Roosevelts: An Intimate History,” which happened to run during our stay. I had been hoping we would be able to watch the series and was grateful that we could see it. I enjoyed the series even more than expected because of our recent visit to Theodore Roosevelt National Park. During our stay at Fort Union, we had a major decision to make. Where should we go next? Our original plan was to cross North Dakota and head to the Great Lakes to enjoy fall colors. However, we soon discovered that the long-term weather forecast, which called for an early winter, was not the best for RV travel. We ultimately decided that we wouldn’t have enough time to enjoy the area before the cold set in. What then was Plan B? Tim came up with a great idea to follow the Missouri River south, just like Lewis and Clark on their return trip. We weren’t sure what there might be to see, but had no doubt that we’d find something interesting. You need to start thinking about writing a book on your travels! The photographs are incredible. Thanks, Ana. All three of the Roosevelts were amazing individuals. I appreciate Theodore even more after learning about him in North Dakota. If you're ever back in the Hudson River Valley in New York, you would love a visit to Val-Kill, Eleanor's home. We went there on our nine-month trip, and the tour there was one of our favorites. Yes, the National Park Service did a wonderful job. It makes it easy to picture yourself back in the fur trade era.